(Newser) – Visitors who remove any bit of nature from a state park are breaking the law. 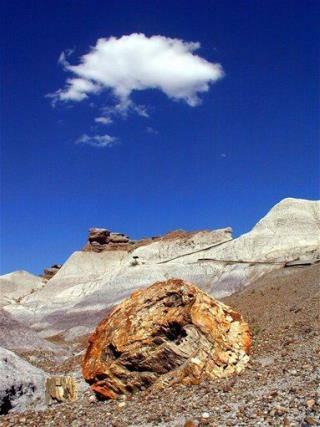 But those who remove a chunk of petrified wood from Utah's Escalante Petrified Forest State Park risk something darker: an alleged ancient curse that visitors claim is the real deal. The park manager tells KSL that each year he's sent as many as a dozen pieces of petrified wood—which time has turned to stone quartz—typically accompanied by an apology in the hope that good fortunes will return to the one-time plunderer. One man wrote that he "thought the warnings were phony. Since that time, I have had three accidents" involving broken bones—plus a motor home fire and a dead car engine. even thought I find the story somewhat interesting, mine is just the opposite.. had bad luck most of my life until I went there, found a small piece in the shape of a heart and took it.. yes I stole it.. yes Im a Democrat.. my luck got better not worse. I had it mounted and bought a gold chain to hang it on and wear it daily.. good things happen to me ever since, not great luck just certain things that would not normally happen. My grandmother had a piece of petrified rock on her mantelpiece that she'd collected in her youth. She tragically passed away at age 98 in her sleep. Damned curse! If you send me your petrified rock and $5 not only will I lift the curse, but also hang a chicken leg in my tree with your name on it. Free Lotto Picks for the first 50 callers. Hurry.